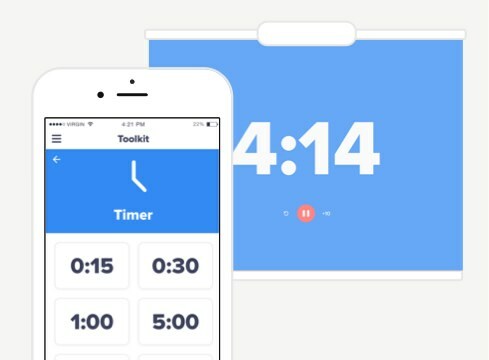 An online timer that lets students know how much time they have left. Whether for transitions, centers, or something else, this classroom timer keeps things moving. The other day we were roasting carrots. We had olive oil, salt, pepper, but at the last minute we realized we had run out of thyme! Bad jokes aside, the Toolkit Timer will keep your class ontrack and conscious of the remaining activity time. Simply select the increment of time and the countdown will be projected in front of your students. Use Timer (and buy an herb plant) and you’ll never run out of “thyme” again. "We use Timer for just about everything in class. It really helps students (and me!) stay focused and keeps transitions quick." You can access the Timer from the top of the main ClassDojo page, next to the clock icon. From there, you have two options: counting up or counting down. You can achieve the first by clicking “Start,” which will prompt the Timer to begin counting up seconds, and you’ll be on your way! The other option is to click “Countdown,” and then select the amount of time you would like to allot. Both options allow you to pause or reset the Timer if necessary. The Toolkit Timer may be simple, but that doesn’t mean there aren’t a few bells and whistles! For example, when your countdown is complete, you can program the Timer to set off an alarm that will let your students know it’s time to draw their attention back to the center of the class. The beauty of the Toolkit Timer is that its features can provide a wide range of benefits beyond just keeping track of time! One of the most valuable and immediate benefits that the Timer can provide is focus: when students are only given a certain amount of time to complete a task, a simple time constraint can minimize procrastination and distractions. 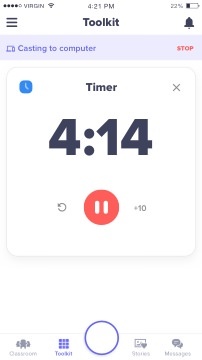 This is especially true thanks to the Timer’s visualization aspect - the digits are big and bold, so if they’re projected onto a screen or shared on mobile devices, they make it easy for students to keep in the corner of their eyes and to reference if needed. If necessity is the mother of invention, then time constraints may well be the mother of creativity. When students recognize that they may not be able to complete a given task in time, it can spur them to think of new approaches to solving problems so they can meet the time requirement, or it may encourage them to practice asking for help from others. As hinted above, another key benefit of using the Timer is that it can foster collaboration and coordination among students. Imagine asking students to form groups and build the tallest structure that they can using given materials in only fifteen minutes; students will quickly realize that the best way to achieve their goal is to delegate tasks so that they can accomplish more together than they could individually. One student may be in charge of drawing up the structure’s design, while another may be responsible for finding the proper materials, while still others work to put all of the pieces together. This builds trust, communication skills, and a sense of shared purpose - all because the Timer is counting down in the background! Lastly, the regular incorporation of the Timer into the classroom agenda fosters skills of time management, prioritization, and places value on getting things done, rather than getting things “perfect.” These are key abilities that will serve students well beyond the confines of the classroom. Sometimes the hardest thing to do when teaching a class is to get started. If you struggle to bring focus at the very start of class, one of the most powerful ways to set the right tone is to run a countdown on the classroom timer the moment students step through the door. 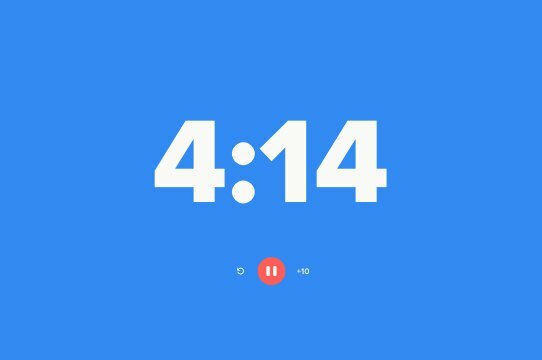 It signals to students that however much they want to play around, they are expected to be prepared to learn when the clock hits 0:00. The same approach can be used to great effect when transitioning between activities. It is much easier to flow through an agenda when the time allocated to each activity is clearly visible. This establishes a rhythm, and gives students a greater appreciation for the boundaries between work time and recess. 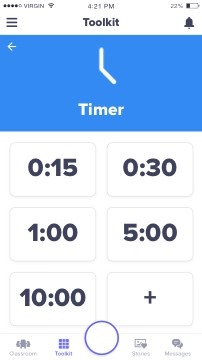 However, setting up the classroom timer doesn’t need to only be about establishing order and getting to work - it can also be a helpful way to add an element of competitive fun or as an additional tool to use with our ClassDojo Groupmaker, a random group generator to make pairing students as easy as possible. Many teachers find that the Timer can help motivate students when it is seen as part of a game tied to rewards for completing work or being prepared at the end of a transition countdown. For example, students can gain points for punctuality, readiness, paying attention, and accomplishing tasks on time. There are plenty of other ways to incorporate a classroom timer app for a range of classroom activities that can unlock the benefits listed above (and many more)! But as with most things, finding out how the Timer works best for you is a matter of, well, time. 嗨！ 您似乎使用的是旧版浏览器。 ClassDojo需要Chrome，Firefox或Internet Explorer 10及更高版本才能运行。 您可以 升级Internet Explorer, 下载 Chrome, 或者 下载火狐浏览器. Older browsers don't have security features we need to make sure your data is safe. Check out our 隐私中心 for more information about how we keep ClassDojo safe and secure. 一旦注册，即表明您同意我们的 服务条款 和 隐私政策 .